The Cathedral Church of the Holy Trinity in Paris is a church in the Anglican tradition. It owes its more commonly used name, “The American Cathedral” to its original American expatriate community as well as its link to the Episcopal Church founded in the United States after independence was won in 1789. It was the first church of the Anglican Communion outside the British Isles and its parish has been witness to the major historical events of the past two centuries in Europe. In the 1830s, services were first organized in the garden pavilion of the Hotel de Matignon, then the home of Colonel Herman Thorn and today the official residence of the French Prime Minister. A parish was formally established in 1859 and the first church building consecrated in 1864 on Rue Bayard. In the 1870s, Dr. John Brainerd Morgan (1843-1912), a cousin of J.P. Morgan, became the second rector of the parish and began a successful fundraising campaign to erect a new and larger church. The present site was purchased on Avenue George V, then known as Avenue d’Alma, from the Duc de Morny, a half-brother of Emperor Napoléon III. The Cathedral was built between 1881 and 1886, following the plans of the great English architect George Edmund Street (1824-1881). First services were held in September 1886 and the church was consecrated on Thanksgiving Day, November 25, 1886 coinciding with the dedication of the Statue of Liberty in New York, thus reinforcing both our French and American alliances. G. E. Street, a leading practitioner of the Victorian Gothic Revival architecture movement, designed the current church in this style. The Cathedral is considered the unique and finest example of this movement on the European continent and is listed on the register of French historical monuments. Street’s other works included the American Church in Rome and the Royal Courts of Justice on the Strand in London. Street died in December 1881 before the finalization of the plans; his son, Arthur E. Street and another prominent English architect of the day - Arthur Blomfield, then took over the work. In his life, the elder Street was elected an associate of the Royal Academy and president of the Royal Institute of British Architects. 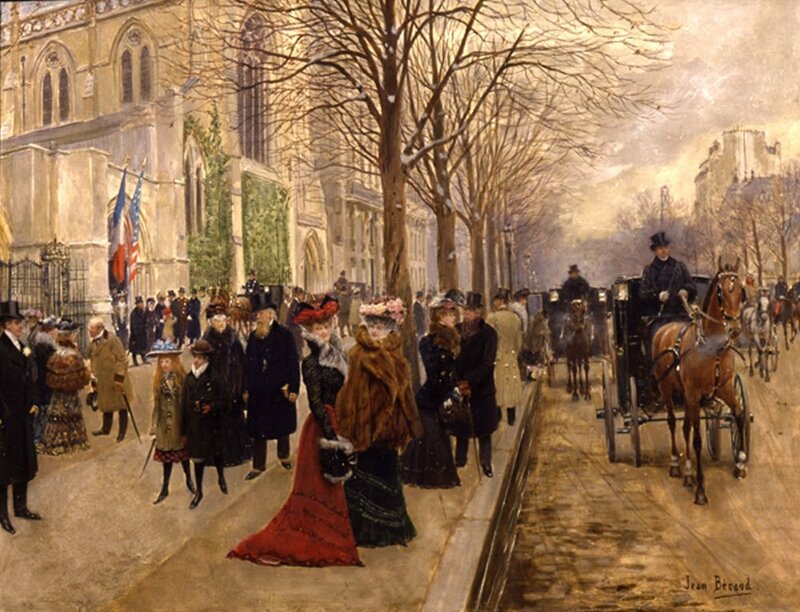 In 1878, he was made a knight of the Legion of Honor in reward for drawings he sent to the Paris Exhibition. Construction of the church edifice was accomplished by Henry Lovatt of Wolverhampton with the tower and other works continuing for more than two decades following the 1886 consecration of the nave. The tower, dedicated on Easter Sunday in 1909, rises 276 feet (84m) and is among the tallest in Paris. Stained-glass windows designed by James Bell of London glassmakers Bell & Beckham, were executed between 1883 and 1893 in the same Early decorated style of architecture as the church. They are the only stained glass of their kind in France. In 1922, Holy Trinity became a pro-cathedral, defined as such in that it continues as both a parish church and serves as the seat for the Bishop in Charge for the Convocation of Episcopal Churches in Europe. To discover more about the rich and extraordinary history of our vibrant community, please consult Cameron Allen’s “The History of the American Pro-Cathedral, Church of the Holy Trinity, Paris (1815-1980); iUniverse LLC Bloomington. The Cathedral has an Archives Committee charged with the task of organizing and safeguarding records dating to before the dedication of the building in 1886. For more information, please contact thweatt@noos.fr.